Good morning sweet friends. My apologies but I plumb forgot to list last weeks Day of Giving winner but I managed to get the name posted yesterday. If you don’t mind, please have a look and see – there are a couple of weeks of cards waiting to be claimed. And we’re back to Friday again and a new card for Day of Giving Friday. Nature sure conspired as it often does, but yesterday brought a packed menu of weird weather with hot, cold, wind, rain and hail – I lost a large branch from my tree also. No worries, today I’m sipping coffee looking out on the rain. I took a patterned background and cut it a couple of times and removed all chads replacing them with random chads to make a different background. I wish I had natural light today to show you how it really looks, but rain has claimed the last couple of days. I left some of the chads out for a more distressed look – the background die is Spellbinders Grate Effect. On top I layered a horizontal die – Spellbinders Diamond Floral and two tails of ribbon through the diamond slots. 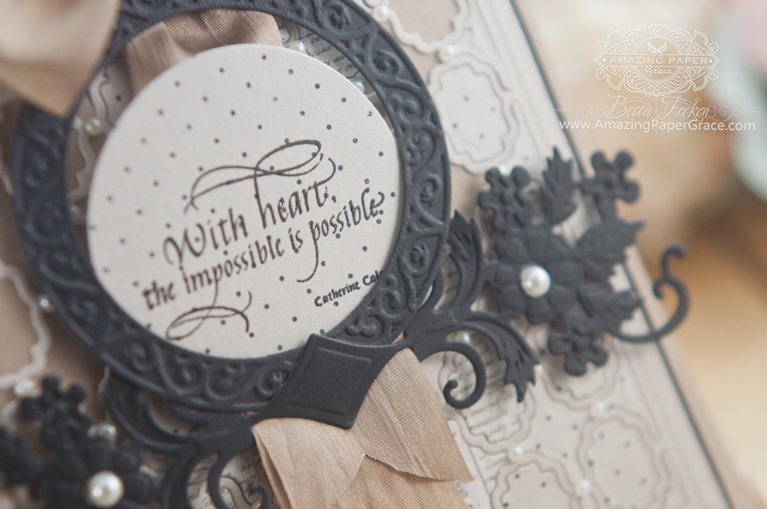 Over the top of the diamond slots, I tucked in the embossed circle from Spellbinders Blooming Collection and used the left over circle cut to stamp my sentiment from Quietfire Design – With Heart. Although I normally share from a large stash of cards, every now and then a new card is up for grabs. It happens every Friday, where I give away a card to a randomly picked reader who leaves a comment in our conversation about a thought provoking prompt I dream up to discuss – here’s a link to my FAQ’s just check out #11. For your comment today – What’s a special tradition you observe to celebrate Easter? Accessories: Spellbinders Grate Effect, Spellbinders Diamond Floral, Spellbinders Blooming Collection, May Arts Silk Ribbon, Recollection Pearls Happy Friday! Have a lovely holiday weekend sweet friends! Our traditions are always about family and gathering together to share a meal. Easter dresses, and coloring eggs, the egg hunt and bunny ears with the grandkids! When children were youn we used to hide the eggs in the garden , now they are all grown up we have a Sunday Easter Lunch after church. Deep sympathies, Kathy, and this sorrowful time. Keeping you and your family in thoughts and prayers as you grieve and remember, and celebrate too, all the love and life you have shared with your dad. Wishing and sending you love and peace in your memories, Easter hope in resurrection, and grace in your days. So very sorry for your loss Kathy. My father died 3 days before Thanksgiving several years ago, and it made celebrating Thanksgiving very difficult for several years. But in time, and after I started my own family, it got easier. God Bless you and your family. Like Easter and Cristmas it always worse . Today is a NO Meat day, I was brought up on the day being sad, no washing on the line today, as my Nan would have said ” Washing in Blood, its like putting Flags out” So the tradition has stuck! Its called Good Friday in the UK, but apparently in Germany its called Sorrowful Friday, which I think suits better! Not many people observe the rituals anymore but there you go…I do! Love todays card and the colours are beautiful too! What a beautiful card. Our special Easter tradition was always go to sunrise service at the lake, go out for breakfast and then go home and make a ham. Now that kids are grown we just play the dinner part by ear. Happy Reserection Day and God bless my friend. Ok, I have to revisit black. You’ve made a believer out of me! This card is fabulous!!! I just LOVE the black with kraft color. WOW!! LOVELY CARD BECCA! I LOOOOOOVE that Taupe & I’ll have to look around on Amazon for dies…..they’re so much cheaper there! There is something awe-inspiring about your work; for me it is sunshine with an intermittent breeze, and aha experience surrounded by a physical need to know all of the parameters of size, shape, color and texture. You amazing me with your creative soul. Another gorgeous card here again today Becca, very very beautiful as always hun. Lovely inspirational card. The love of God, most assuredly made the resurrection possible! I am blessed to have my children and three grandchildren visiting for Easter this year. Thankfully the 12 inches of snow that fell at one of their homes, won’t stand in the way of their 3 hour drive to be with us, where we were spared. Our tradition is the finding of hidden, lovingly prepared Easter baskets, which always, must include a religious item, along with the bunnies and other things. What a great card for this Good Friday! I love everything about it – the colors, the composition and the sentiment. A special part of holy week is the Maundy Thursday service, we share a simple meal followed by worship. It’s a somber yet joyful occasion and sets a reflective tone. Easter is all about celebration and a great time to be in the choir! What a beautiful card today, it is so gorgeous. Our traditions are the ones held by a lot of people. A day of fasting so only one meal which is fish. Stations of the Cross in Church at 3 p.m. No washing of clothes, no shopping and a day spent with family. So we have a peaceful, no rushing around type of day!!! Kathy, I send love and prayers to you and your family, for we know not the hour or the day. Oh what a lovely card, never thought of using blk. with kraft. Our custom for Easter is to go to the sunrise service at church and stay for the Easter breakfast. After that we join in on the festival service. If the grandchildren are coming over for dinner, we do an Easter egg hunt – just a little candy and some money in the eggs. I send an Easter Blessings card for my friends and family. I don’t do this now but when I was growing up we took a basket of food we would eat on Easter Sunday and have it blessed at the church by the priest. We are supposed to have 70 degree weather for Easter so I am really looking forward to it. I wish you a very beautiful, blessed and Happy Easter my friend! You put so much love in your work.I show just looking at any of them. They are all absolutely gorgeous.I love to look through the cards you have displayed and wish I could do such beautiful work.Thank you for sharing your cards. They are a joy to look at. As for Easter, we go to church and have a family dinner with my only family. That includes my husband, sister, niece and nephew. We lost our mother last year, and no one can fill her space. But we rejoice being together with good food and good company. Then the men drift off to watch something on TV and the women sit around the table catching up on our lives. Gorgeous card Becca with another spectacular bow! When we were growing up, my sister and I always dyed eggs the night before, then mom would hide them around inside the house after we went to bed. We would have our Easter egg hunt as soon as we got up in the morning. Mom started counting how many eggs she was hiding the year after we didn’t find all of them and a couple of weeks later, we just had to follow the smell to find the last one! Beautiful soft colored greeting card! Great idea to remove the chads and mix it up a bit. Love that. Well, I have not had except for one Tradition to Celebrate Easter and it is this: To allow myself some quiet time to reflect upon what Jesus truly did for me. To allow myself to feel the emotions he was going through, the rejection, the pain, the sorrow,the agony of his physical pain,mental pain and emotional pain of God turning his back on him because he cannot look upon sin.The loss of his friends at the lowest point of his life. Even to the point of feeling all the spit upon my body. It truly puts into perspective the Love that God had for me. Beautiful card as always! It is just hubby and myself but he wants to cook some ribs in the smoker and my part will be potato salad. I always make deviled eggs for Easter. When I was growing up we always got a new dress, shoes and hat to wear to church. I can remember even wearing white gloves. Beautiful card Becca! Love the calming colors. Becca your card is level and Happy easter to you and yours, my tradition a Easter is to have all the family home. What an exquisite card Becca – love the colours and the background id beautiful. Good Friday Becca, beautiful card as usual love the bow!!! All the family get together for dinner!!! Can’t wait for the egg hunt, my granddaughter is going to love it!!! Kathy you and your family are in my prayers. Hi Becca. This is a gorgeous card. Love the soft coffee colours. I rarely use black, but this beauty has convinced me I should use it more often! We gather at Church at 8.30 am on Good Friday morning for bacon sandwiches and then walk the 2.5 miles to the town centre, passing 2 other Churches en route and gathering more walkers behind the Cross. Several other outlying Churches do the same, collecting other worshippers to walk with several 7 foot crosses and we then join a collective form of worship at 11 am, right in the pedestrianised High Street, as others shop! Beautiful card, love those die cuts they all go so well together. For Easter when I was little we would go to Easter egg hunts now I just try to make it to church to celebrate Jesus and the true meaning of Easter. Thanks for sharing. A beautiful card….as always you post lovely cards – such a God-given talent…thank you for sharing your projects with us. You are an inspiration! It may sound silly, but my tradition is to go to church, as I do every Sunday…but, Easter is always special to me! Lovely and elegant card – the steel gray is so pretty. I like how you filled in the chads. It is so pretty. Such a stunning card, love how you have used the grate effect die in the background. I always buy family members an Easter egg every Easter, does not matter how old my children get lol! Beautiful card. Love the soft effect the addition of the diamond floral die cut gave this card. We always host the Easter Egg Hunt for the kids. I decorate the back yard with a large Mr. & Mrs. Easter Bunny yard ornament that I made several years ago and groupings of large egg ornaments that are decorated and have the kids names on them. Always makes for great Easter pictures. We usually have an early dinner with family and close family friends. One of the traditions we have at our house: eggs hidden night before, it does not matter if you are an adult or a child, if there is a basket with your name on it, you just have to go and look for your eggs and some of your goodies. Can’t help but think of all the people in this world who do not have much to celebrate especially the ones who are terrorised . It is a wonderful time for Christian people to celebrate . Oh, wow! This card is spectacular! I’m going to have to get a thesaurus to find different superlatives to describe your cards as they are too beautiful for trite words!! Hi Becca, This is absolutely stunning !! I love how you have used the grate effect die with some ‘fall aways’ from other papers, leaving some openings empty, what a fabulous technique, I love it. My Easter is always hectic, my Church Services are always busy in the week beforehand, we have a ‘footwashing’ on Maundy Thursday and after the Service we have a ‘Vigil’. Then we have a Service on Good Friday, then today it was cleaning and getting the Church in readiness for Easter Day. Tomorrow is an early start, I go to the ‘Dawn’ Service at 6.30am (made even harder because our clocks go forward one hour tonight), then we have breakfast at Church, clear up, make our way back home to get ourselves ready for the Family Service at 10.30am. Like I said, it’s hectic haha, the emotions are unbelievable this Easter week, but it is a lovely time. all the inspiration and kindness in sharing your beautiful work. Morning Becca, another gorgeous card and a great idea replacing some of the pieces in different card stock. We usually all get together at Easter and exchange Easter Eggs and have a great time. Hi Becca, I love what you have done with the grate effect die. Easter is a religious week for us. Fasting Good Friday & going to numerous masses starting from Holy Thursday through to Easter Sunday. Then having a big Easter Sunday lunch celebration with loved ones. I am from South Africa and have just found you on the internet Just love your work.Can’t stop looking and watch your videos. Please never stop doing what you do so so well. I am so inspired. I am 64 years of age and has been making cards ever since I can remember. Just not all the great dies you use are available here. But still love you. Keep well.